If you’re considering an Italy honeymoon or even just a romantic getaway in the boot of Europe, then we can’t recommend it enough. The allure of Venice’s canals, Cinque Terre’s cliff-hugging villages, and to-die-for Italian cuisine had us entranced before we even stepped foot in the country. 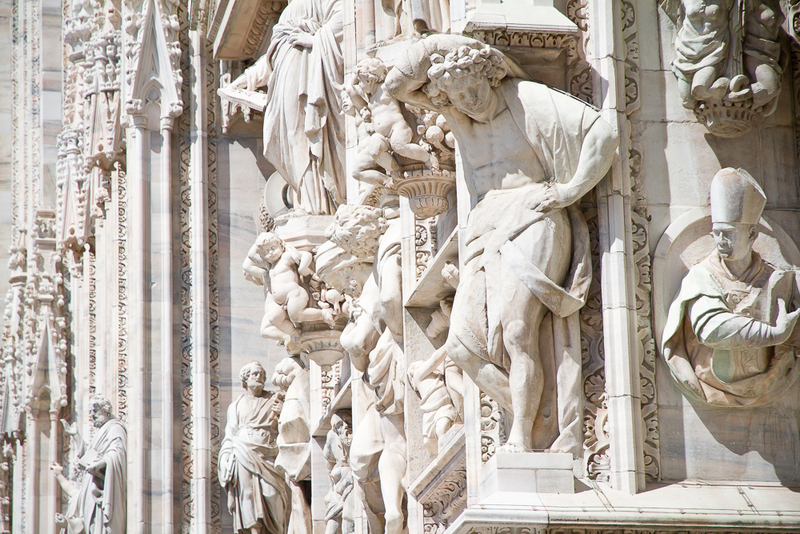 Italy’s attractions include 54 UNESCO World Heritage Sites, more than any other country. 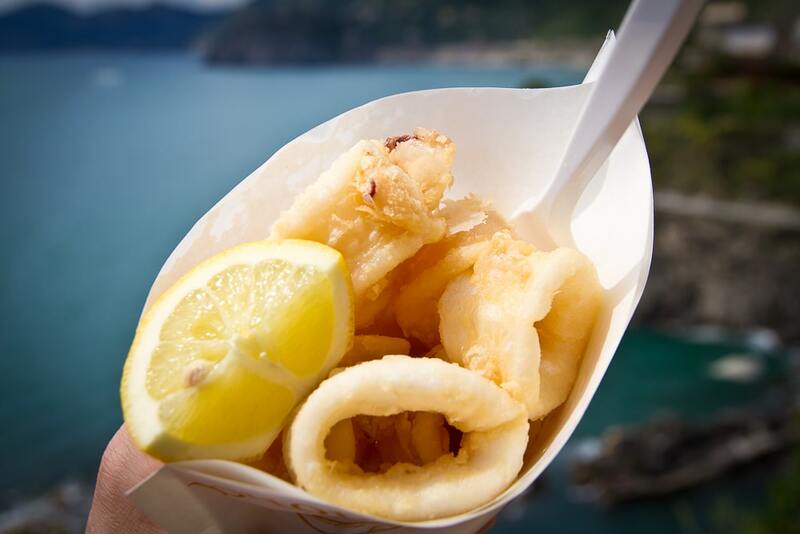 However, it was the casual strolls with no destination, relaxed meals in random trattorias we stumbled upon, and afternoon bottles of prosecco enjoyed in our room overlooking the Ligurian Sea that truly made our honeymoon in Italy. How much more romantic can you get than a room at one of these places overlooking the sea? When Emily and I got married, we chose to celebrate our big day in Santorini Greece. Roughly halfway between Canada, my native land, and Taiwan, where Emily is from and we live, Europe seemed like a fair choice for our friends and relatives on either side of the world, and more than anything, was simply an excuse to travel to places that we had always dreamed of visiting. Once we decided on Greece for the big day, choosing Italy for our honeymoon was a no-brainer. We also opted to celebrate in late May, taking advantage of ideal weather and beating the summer masses of tourists. 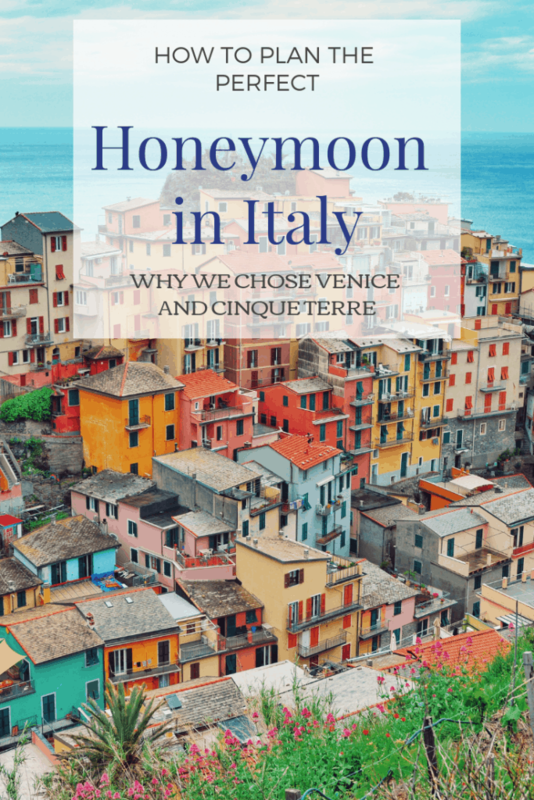 Deciding which part of Italy to visit for our honeymoon was no easy choice with so many alluring places to visit in Italy. The country offers so many suitable choices; some ideas we considered were staying amongst the vineyards in Tuscany, trying pizza in Naples and relaxing on the Amalfi coast, and getting off the beaten track in Puglia, the heel of Italy’s boot. In the end we decided to keep it simple and narrowed it down to only two places: Venice and Cinque Terre. I’ll explain below why we chose each of these. For both Venice and Cinque Terre we had some big surprises, both positive and negative for Venice, and pretty much all positive for Cinque Terre. In fact, we loved Cinque Terre so much that I also wrote this post on 20 reasons why we loved Cinque Terre on our honeymoon. We also spent a few days in a third stop, Milan, because we found a cheap budget flight from there to Athens, where we would meet our family and friends for our wedding in Santorini. In total, we spent two nights in Venice, four in Cinque Terre, and one in Milan. Scenes of Venice familiar even to those who haven’t been there. 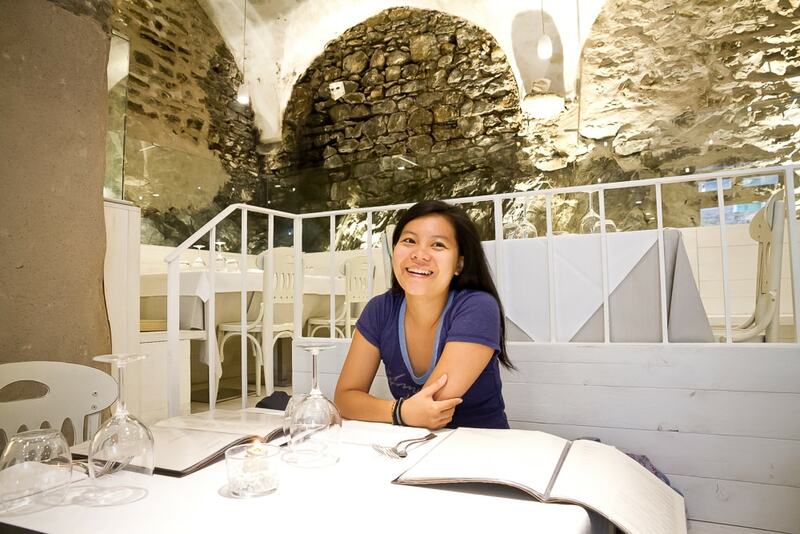 Before our wedding and honeymoon trip, I had actually been to Italy before with a friend. Venice had been my first stop in Italy, and I wanted my soon-to-be-wife to enjoy the same introduction to Italy that I had. 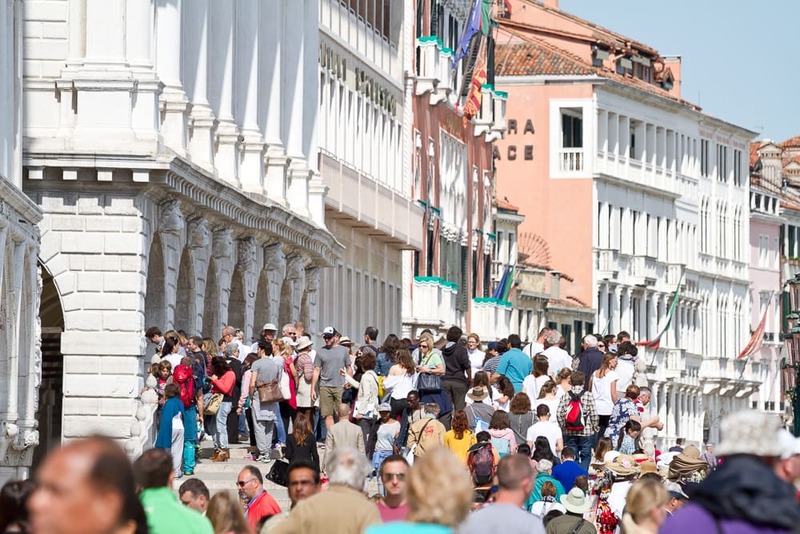 Love it or hate it, Venice feels like the epicenter of tourism in Italy. 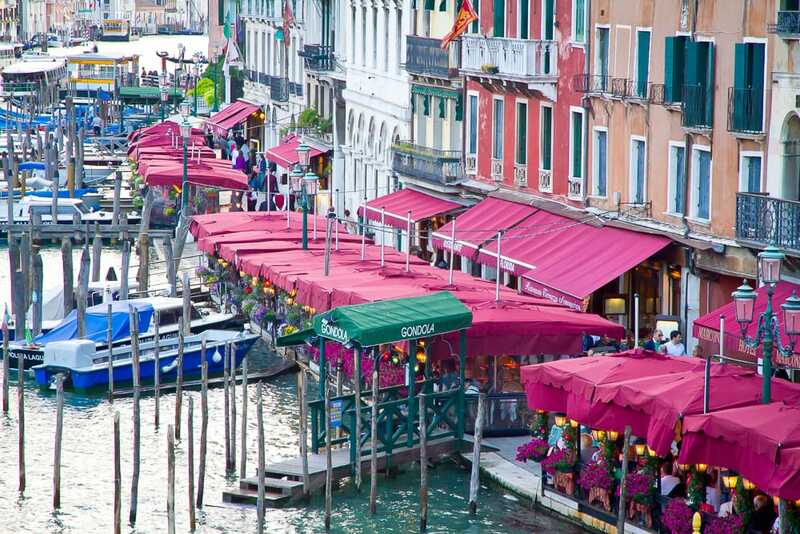 There are so many camera-clutching tourists crowding the floating city’s streets and bridges there that we wondered on several occasions during our visit whether there were any actual Italians living in the place. But my way of thinking when planning the honeymoon trip is that you sort of have to visit Venice if you go to Italy, in the same way that you can’t visit France without seeing the Eiffel Tower or China without walking along the Great Wall. I also feel that anybody who has been to Italy once will be back again. 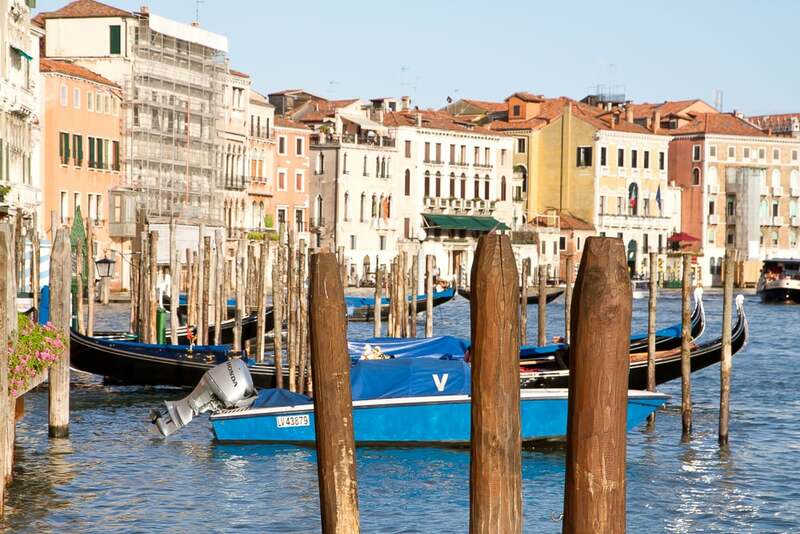 We are already planning our next trip to Italy, and will get a little more off the beaten path, but I don’t regret that we chose to start with Venice this time. 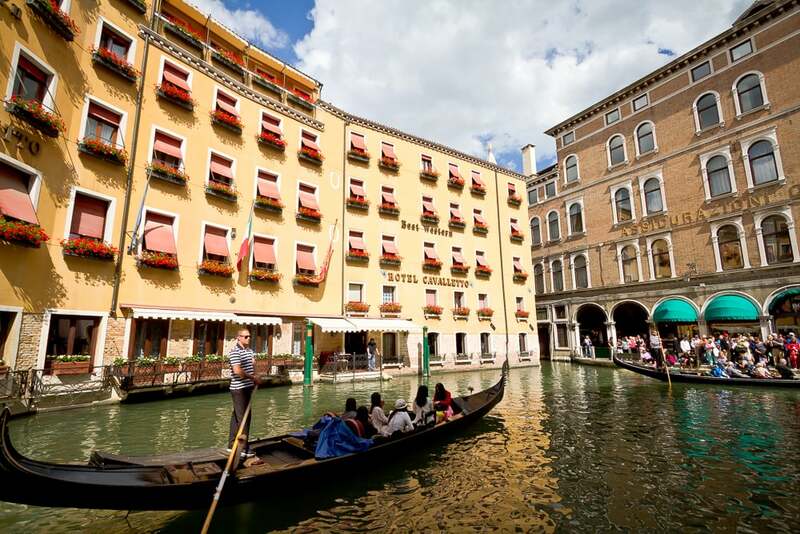 Venice Quick Tips: Catch this express airport shuttle or shared water taxi from the Marco Polo airport to the city center. For a more luxurious arrival, take a private boat from the airport directly to your hotel. Here’s a highly recommended boat tour of the Venetian islands. 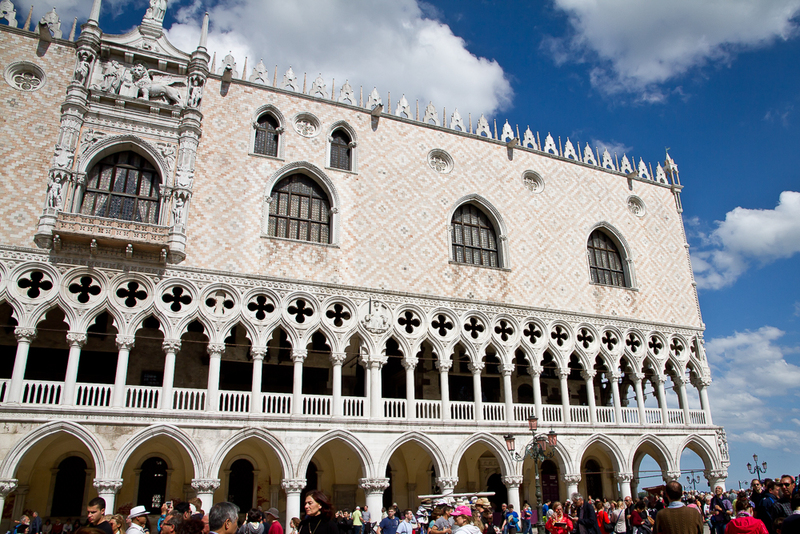 Make sure to your tickets in advance to skip the lines at Doge’s Palace. 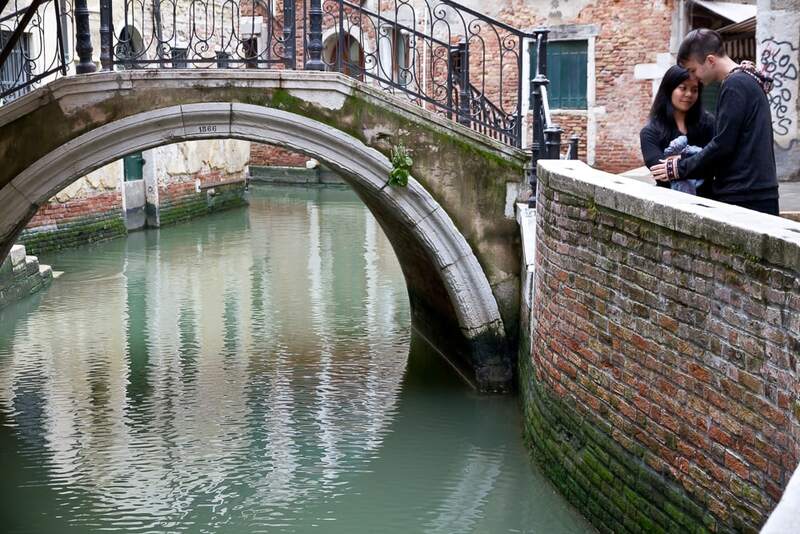 But true romantics should splurge on a 1-hour private gondola ride! Touristy, but what about that view! 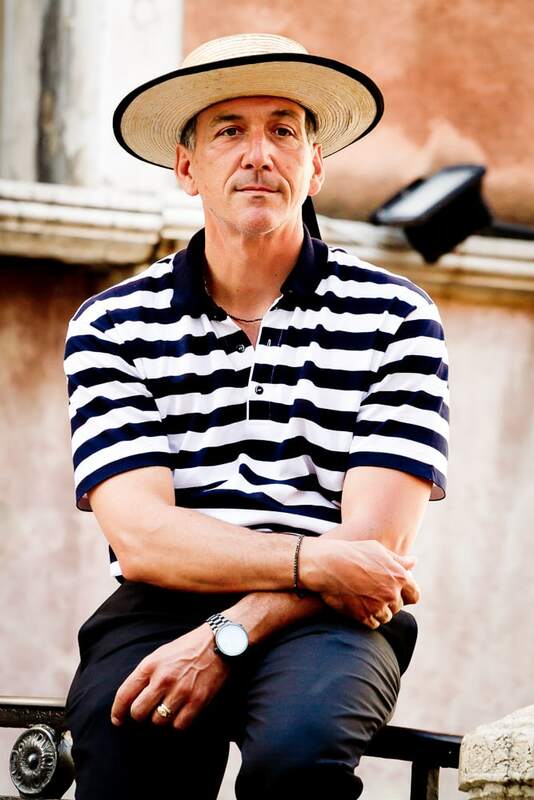 And who doesn’t want to be steered around on a gondola by a man like this? Try this 1-hour private gondola ride or a more affordable group ride! 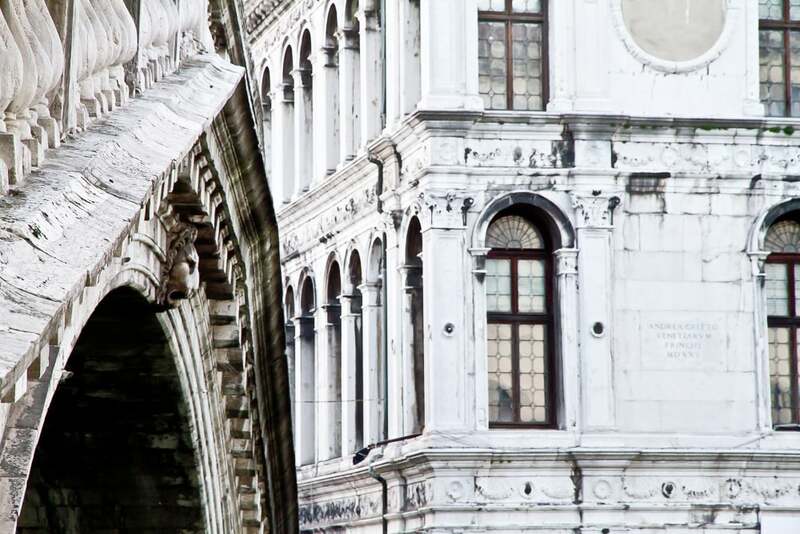 Even with the tourist crowds, Venice is undeniably charming. What surprised us on the plus side was how it was still fairly easy to break away from the crowds. Our favorite thing to do in Venice was simply getting lost (and you don’t have to try hard to do this!) and exploring whichever tiny lanes we found ourselves in. Of course we still took in the major sites like St. Mark’s Basilica, St. Mark’s Square, the Grand Canal, and Ponte di Rialto, and they are all jaw-dropping. But the most romantic (and memorable) things that we did were wiling the time away in a café overlooking a small square we found by accident, peering into local churches as worshipers gathered and prayed, and flipping a coin to decide which direction to go after every time we crossed a small bridge. We didn’t go to Venice expecting it NOT to be overrun with tourists, which would be just setting yourself up for disappointment. But what did surprise us the most was how awful the food that we had in Venice was. 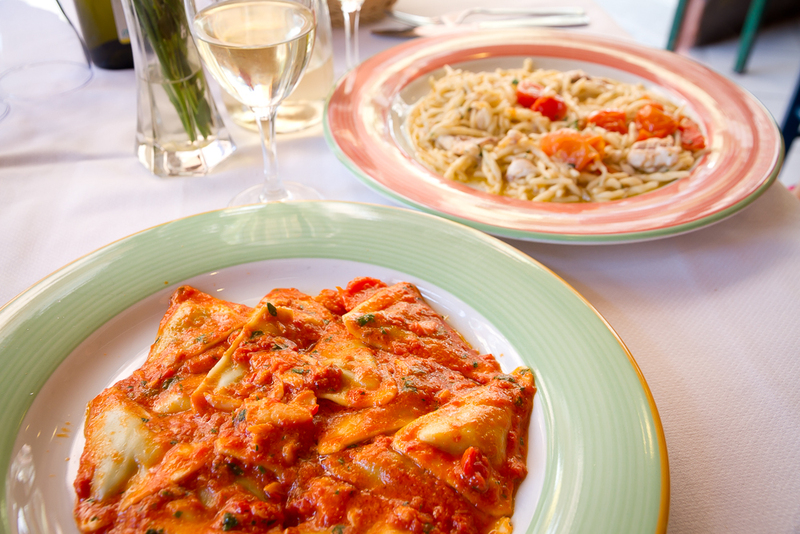 As lovers of Italian food, we went to Italy with high hopes, and those hopes were crushed every time we sat down to a meal in Venice. In retrospect, there were a few reasons for this. First, we didn’t look up any restaurant reviews before or during our trip. 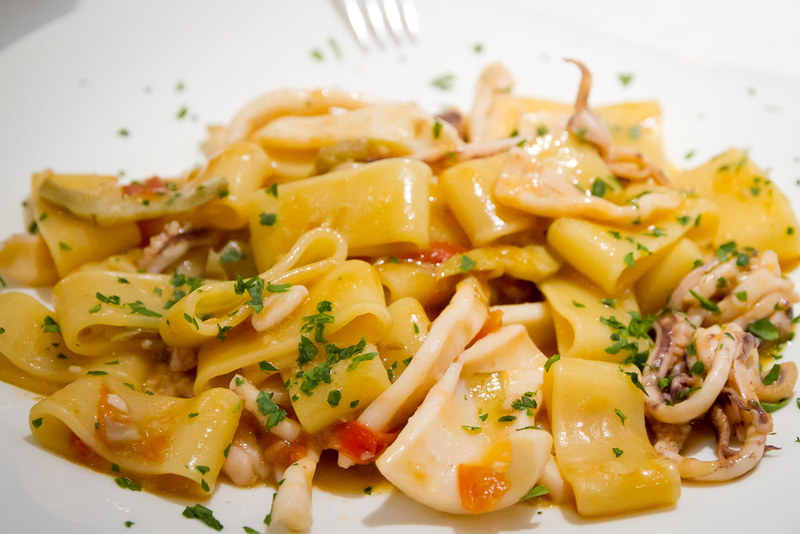 I’m sure there is plenty of extraordinary food to be had in Venice, but don’t expect to just stumble upon it! Second, we chose restaurants based on their views and atmosphere, often along the main tourist routes, but the views obviously came at the expense of decent food. In one particular restaurant overlooking a gorgeous canal, we both agreed that the pasta we were served was about on par with microwave pasta sold at 7-11 in Taiwan where we live. Third, we were on a budget, and weren’t willing to spend the kind of money that would be more likely to guarantee a quality meal in Venice. So my advice here is to do some research on good restaurants before your trip! Literally the best things we ate in Venice were gelato (I could never get enough of it) and a falafel and beer we had from a street stall in the square outside our hotel one night. 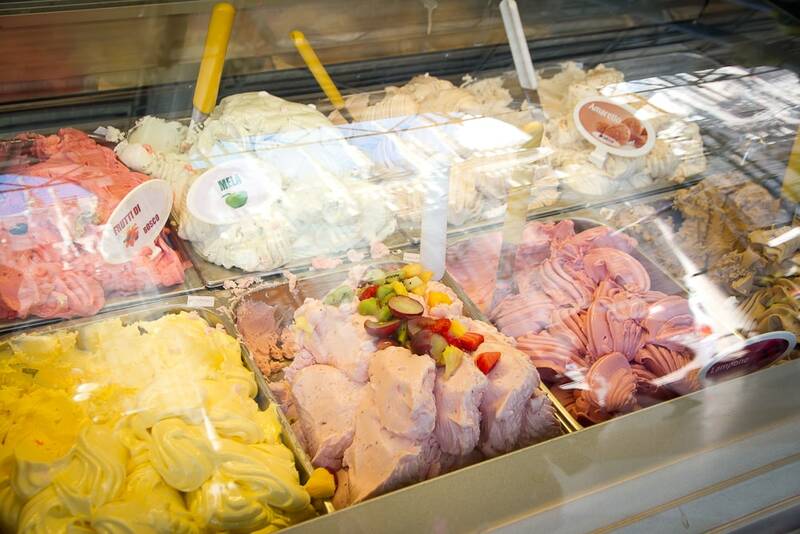 Gelato: the best food we had in Venice. After doing much research on where to stay in Venice, we concluded that we didn’t find it necessary to pay an arm and a leg to have a view over a canal, since we’d be exploring the canals all day anyway. We wanted something that was budget friendly but also was clean and cozy. In the end we went with B&B Sognare A Venezia (read reviews / see prices). It was small, cute, family-run, and a quick walk from the train station. The owners were friendly and our room had a nice view over Campo San Geremia, where we could watch the crowds going by below. 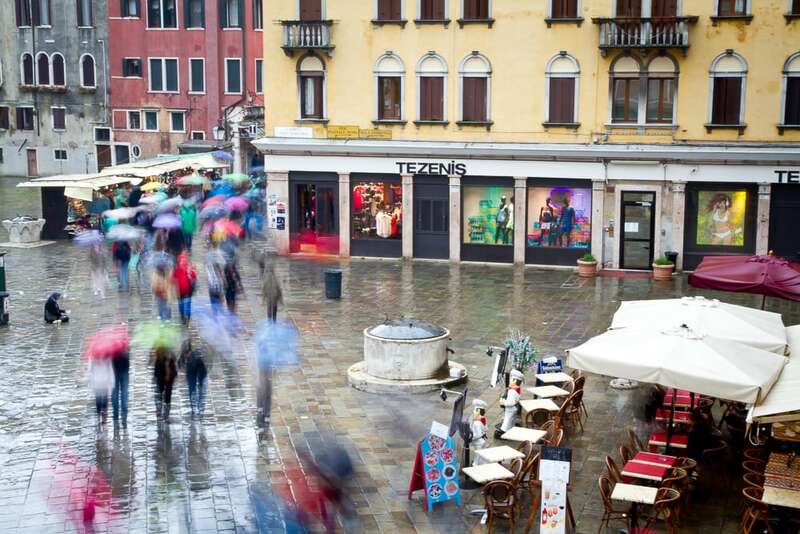 View of Campo San Geremia from our room when it rained one afternoon. There is no direct train from Venice to Cinque Terre. This is probably for the better, though, because if it were really easy to get to, tour groups would also flood in, and the region would lose some of its appeal. There are multiple routes that you can take from Venezia Santa Lucia train station, usually requiring 1-3 stops and about 5-7 hours, which took up the better part of a day of our trip. 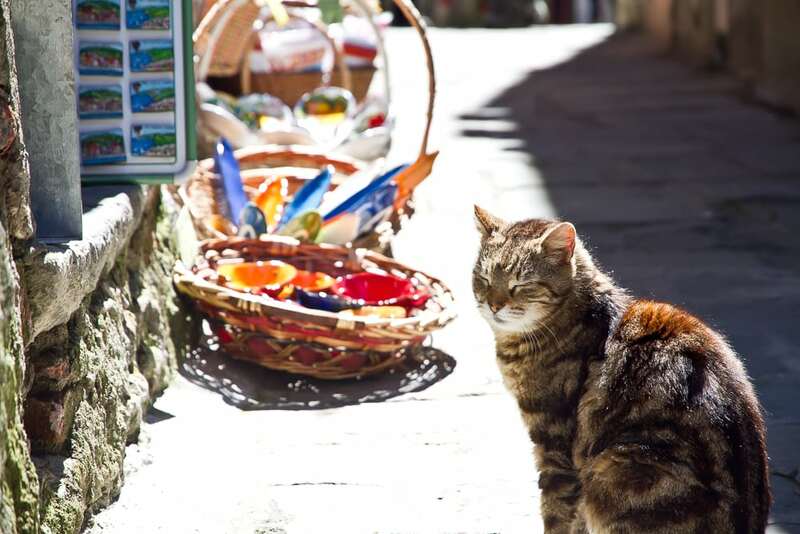 However, we wouldn’t regret it, as we fell in love with Cinque Terre from the moment we arrived. 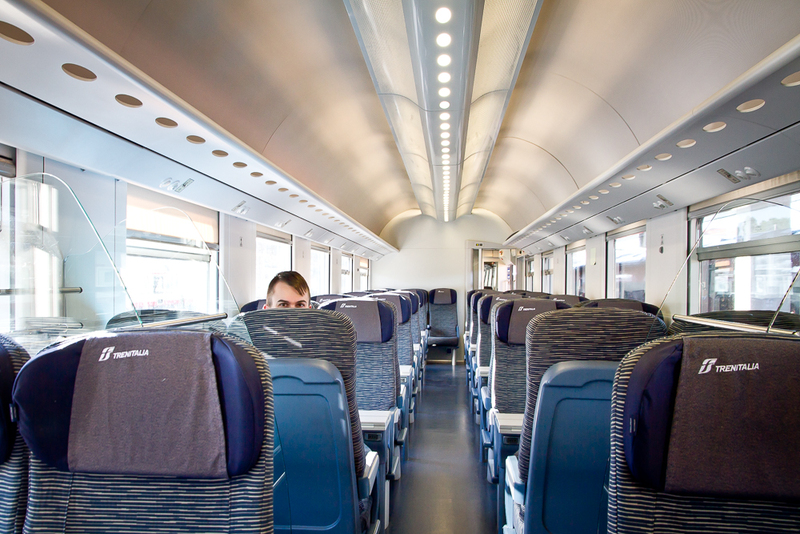 See here for more details on the train route options from Venice to Cinque Terre. 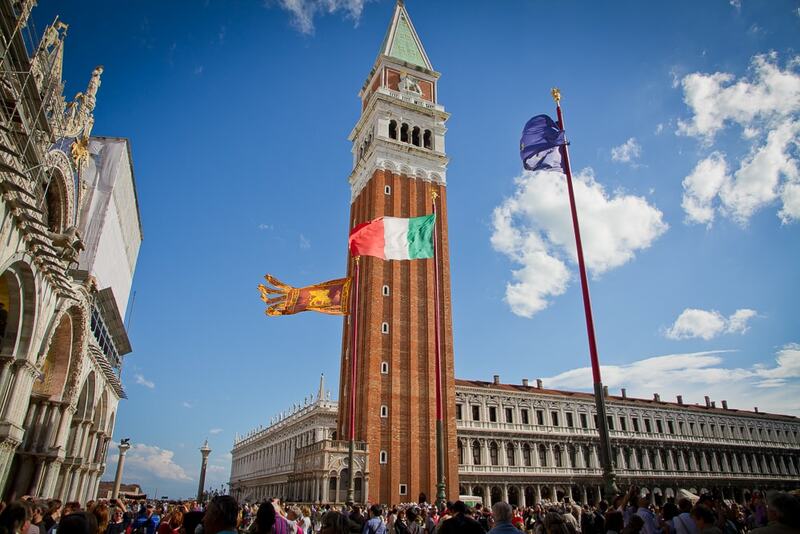 Once we were on a train out of Venice, we already felt like we were leaving the tourist crowds behind. Perhaps this was because we were somehow the only people on our train car for part of our trip! 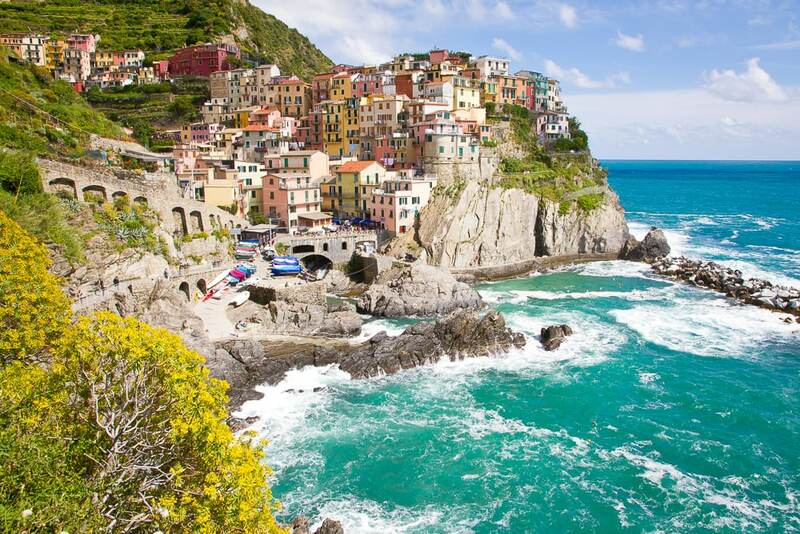 It only takes one look at a picture of Cinque Terre to understand why it’s the perfect place for a honeymoon in Italy. We had spent hours gazing at the surreal, picture-postcard images of villages perched on cliffs online before our trip, but this still didn’t prepare us for the awe we felt once we were actually standing there. Read more about why we loved Cinque Terre in this separate post on the Cinque Terre portion of our honeymoon. 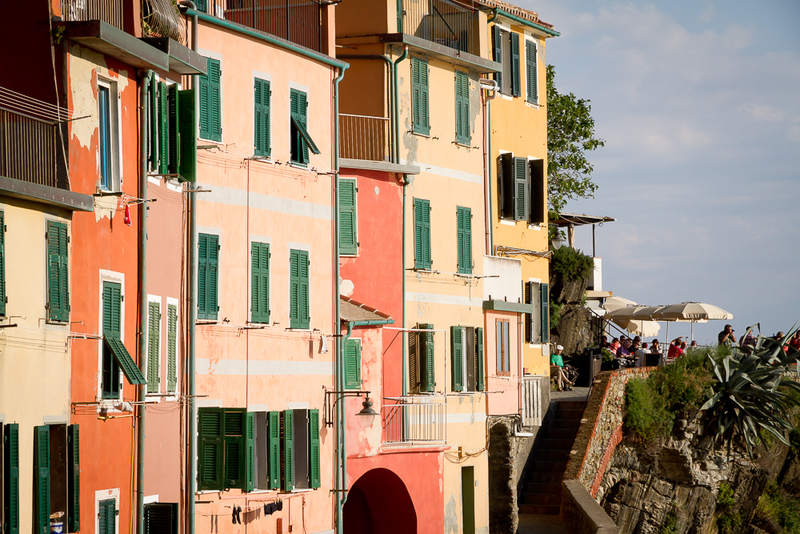 If you’re staying in Florence (another romantic choice), you can also see the best of Cinque Terre in a day trip from Florence. 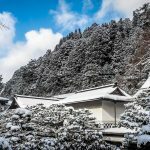 Being big on travel planning, I had spent countless hours toiling over which of the five villages to stay in. Each one looked so incredible and unique that at some point or another, I decided on each of the five villages at least once before changing my mind again. 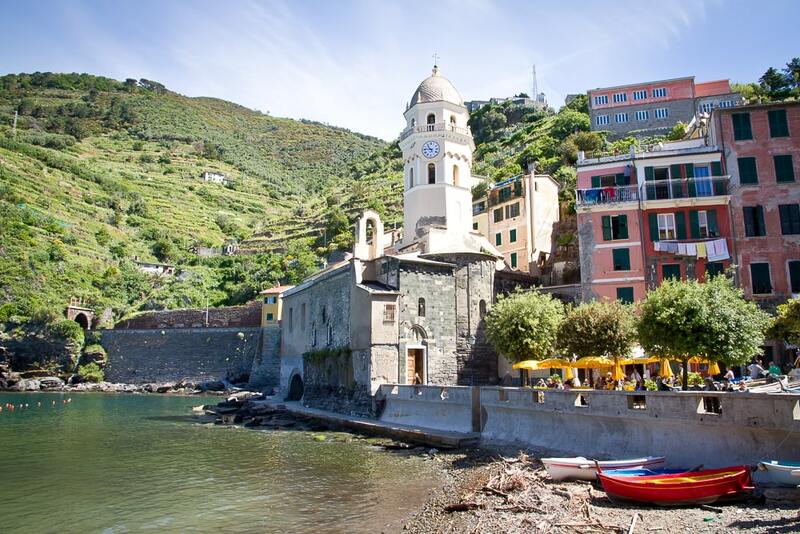 Monterosso is larger and flatter than any of the other five villages. It is the only one that we didn’t visit on our trip, because to us it didn’t seem to have quite as much character as the others, but it has by far the largest and best beach. 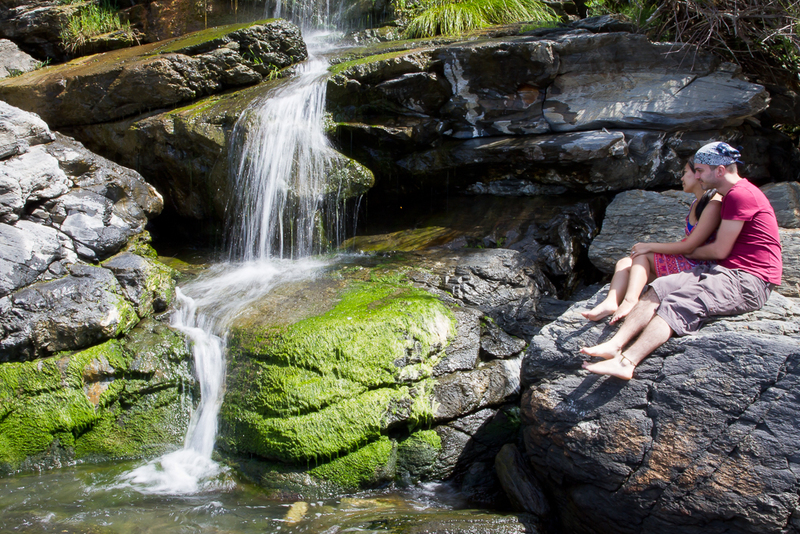 If you care most about the beach (or not walking up too many steep stairs), then it might be the best choice for you. 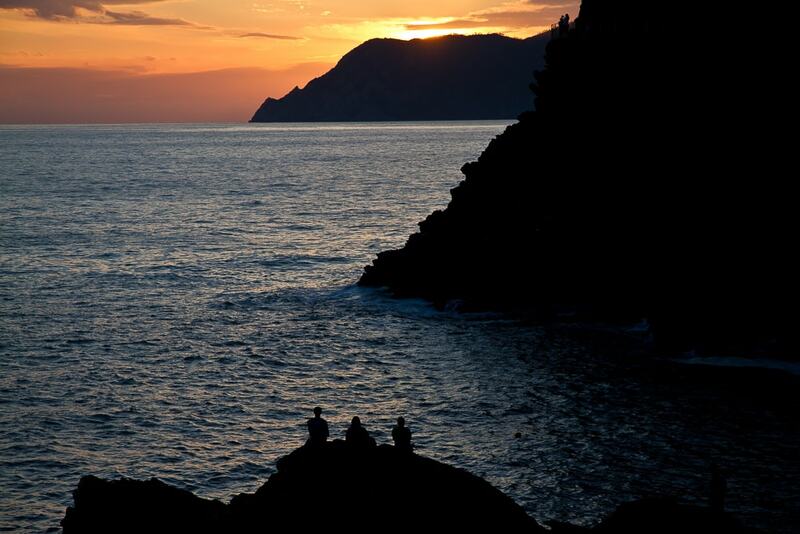 For something romantic, try this Sunset Kayak + Wine Tour and Aperitivo from Monterosso to Vernazza. 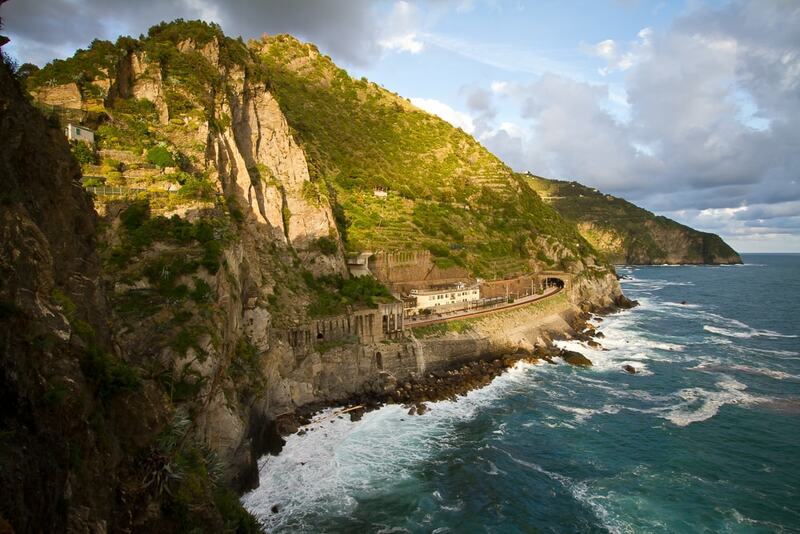 Vernazza is the most popular Cinque Terre village, and is also relatively flat. We visited by train from Manarola one day and found it to have a livelier vibe, but we remained happy with our choice to stay in calmer Manarola. There’s a tiny beach and beautiful church on the waterfront, which made for a worthwhile visit. 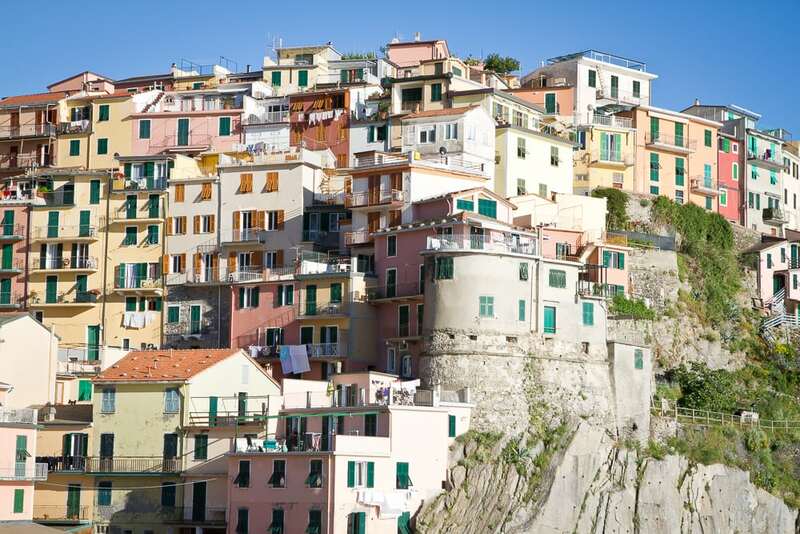 Corniglia is the only village without access to the sea, as it sits on a hilltop overlooking the ocean. 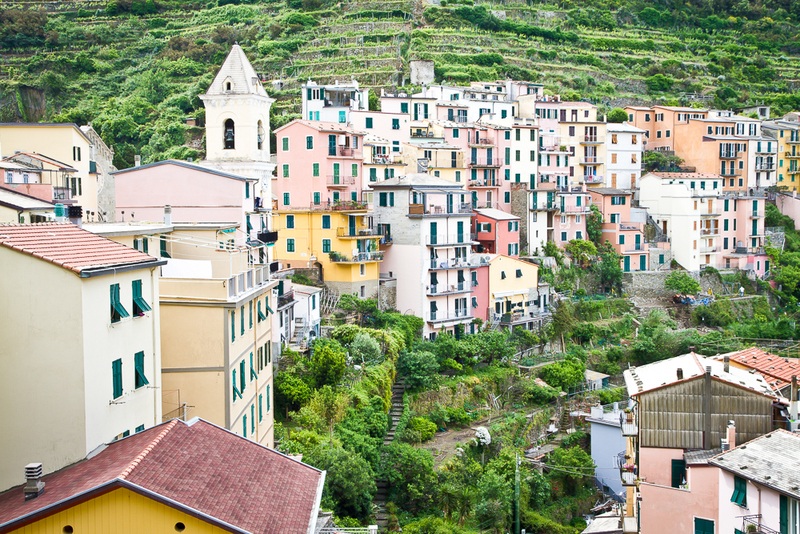 We visited Corniglia by hiking there from Manarola, which was one of the highlights of our Cinque Terre stay. The views looking down on Corniglia as we descended from the mountain were nothing short of breathtaking. If you arrive by train, you have to catch a bus to the town square or walk up 382 steps. 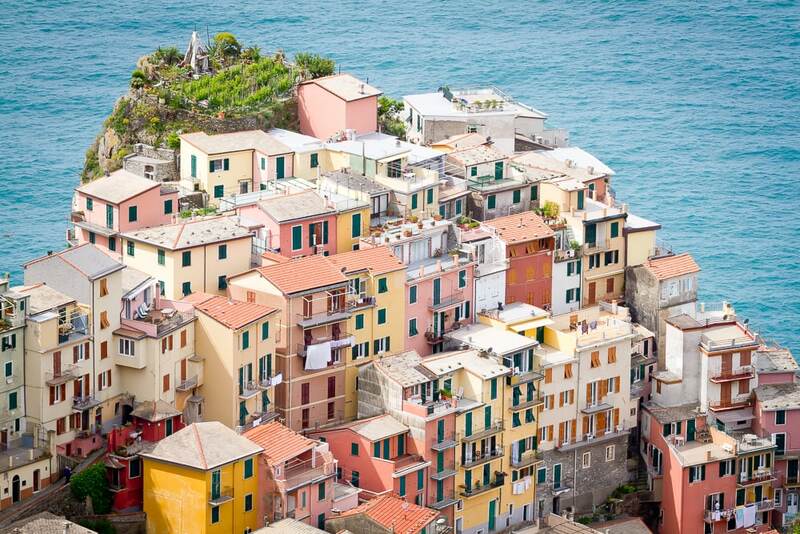 Manarola is where we stayed, and we never once regretted our choice. Each of the five villages in Cinque Terre is gorgeous in its own way, but the view of Manarola from a walking path across the bay is, many would say (and I would agree) the most beautiful view in Cinque Terre, and probably the one you see most often on postcards and images representing Cinque Terre. Manarola is easily the most romantic village. Besides being stunningly beautiful at every turn, it is small, cute, and quiet. 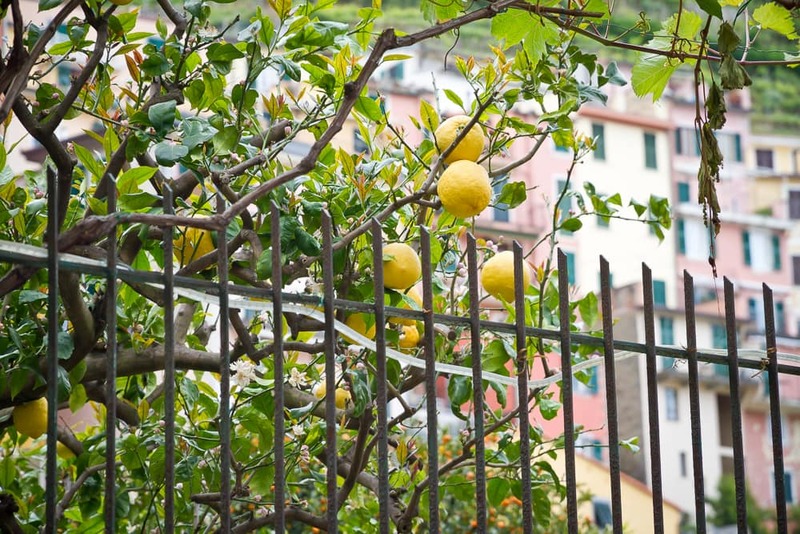 Above the village, you can hike through terraced orchards of lemon (some of which are used to make Limoncello) and vineyards on a trail that continues on to Corniglia. 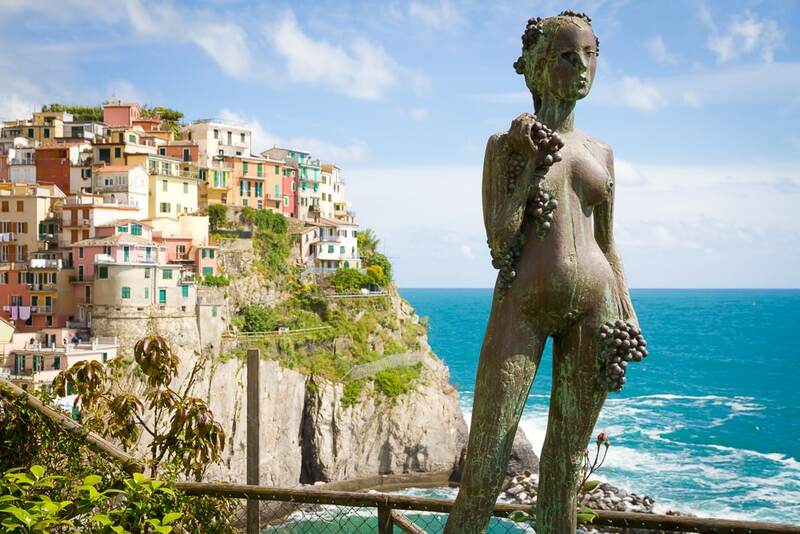 You can tour the vineyards and taste local wine on this Manarola wine tasting tour. 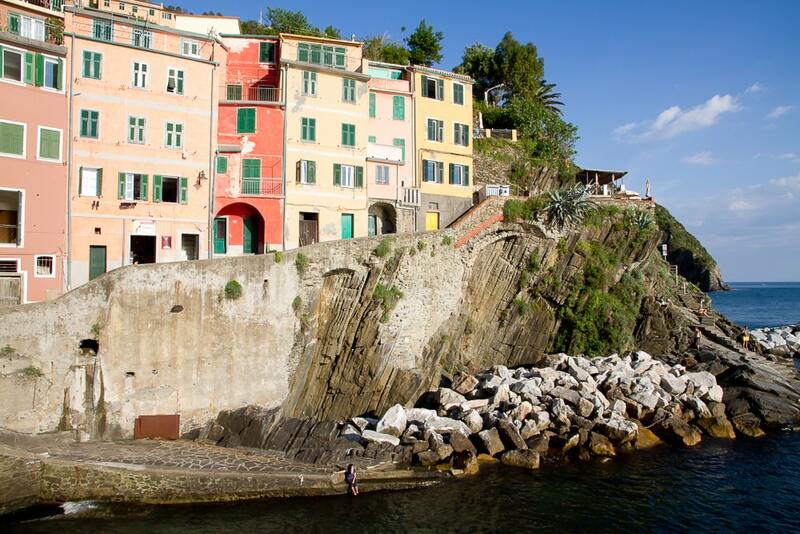 Riomaggiore is another very pretty village that I very seriously considered. Supposedly it has more budget accommodation choices and drinking/party spots, but what had me tempted was it’s small but very beautiful harbor. We visited in the late afternoon one day for dinner and took in a sunset that painted the village’s pastel-colored buildings in a magical glow that I will never forget. Riomaggiore also has a wine tasting tour, where you can taste the region’s signature Sciacchetrà wines. 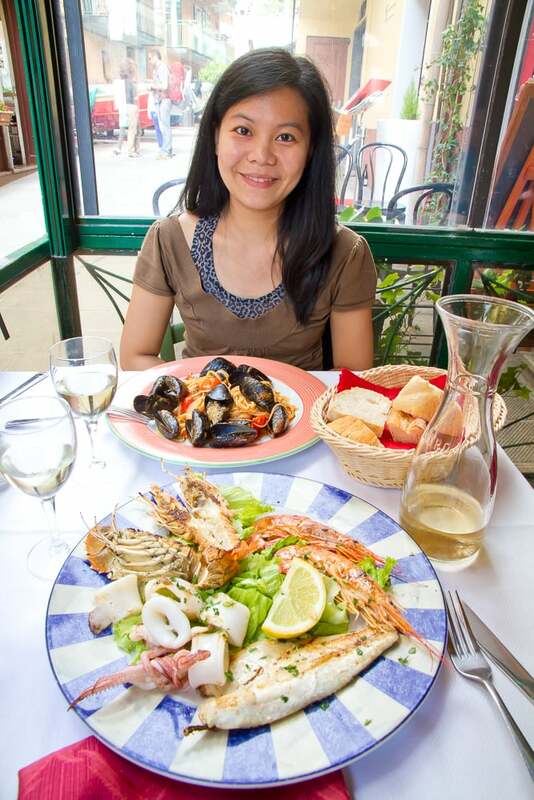 Another reason we visited Riomaggiore was to splurge on a meal at Dau Cila, which we had read was the best restaurant in Cinque Terre. Of course we can’t confirm that because we only tried a few, but the meal we had was exceptional and the interior had the feeling of being built into a cave. The sunset we enjoyed from the harbor in Riomaggiore after our meal was something that will be forever etched in my mind. To watch the sun setting on Riomaggiore from the sea, try this sunset cruise with food and wine. We went to Cinque Terre with high hopes, but the beauty was greater than we could even have imagined. 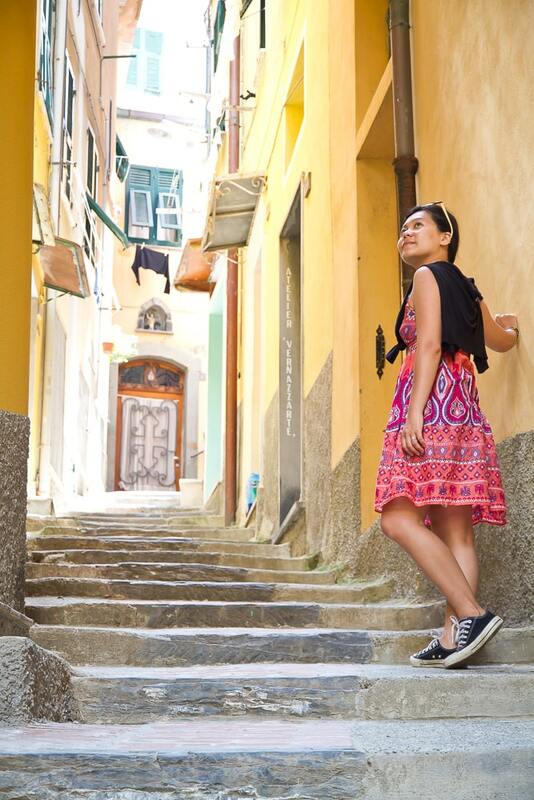 It is no exaggeration to say that our stay in Cinque Terre was perfect. We loved the lack of cars and exploring on foot. As romantics, there was beauty to be discovered at every turn. 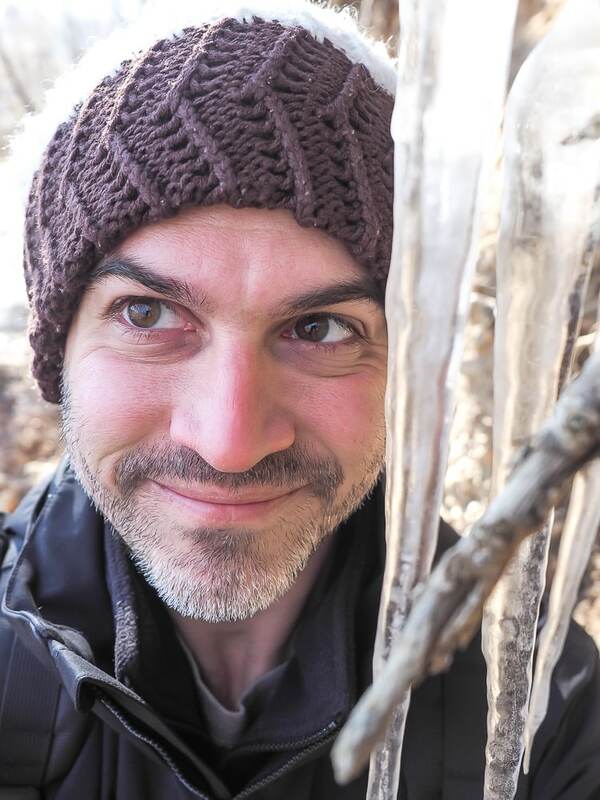 As a photographer, I couldn’t put my camera down. As a nature lover, the hiking trails between villages were magnificent. Certainly there were tourists, but it seldom felt over touristic. But perhaps our biggest (and best) surprise was how much we loved the food. As seafood lovers, we were right at home. 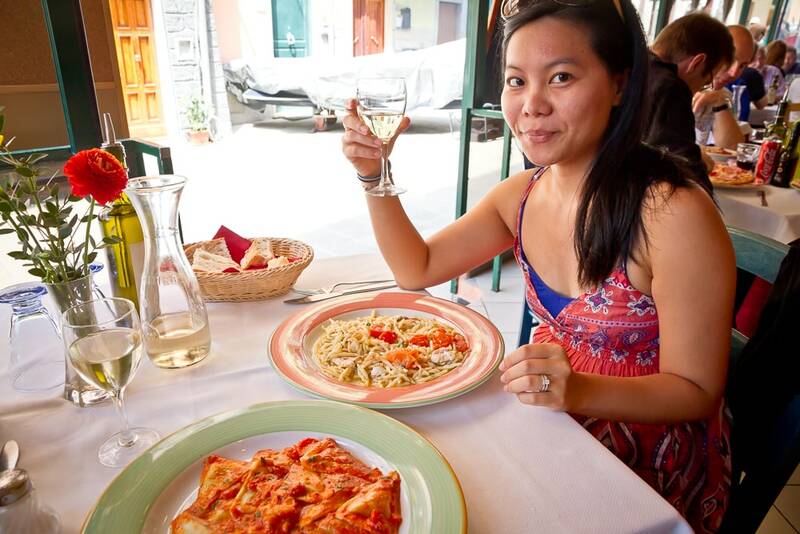 The first restaurant that we ate at in Manarola, La Scogliera, instantly became our favorite and we returned to it every day for the duration of our stay. 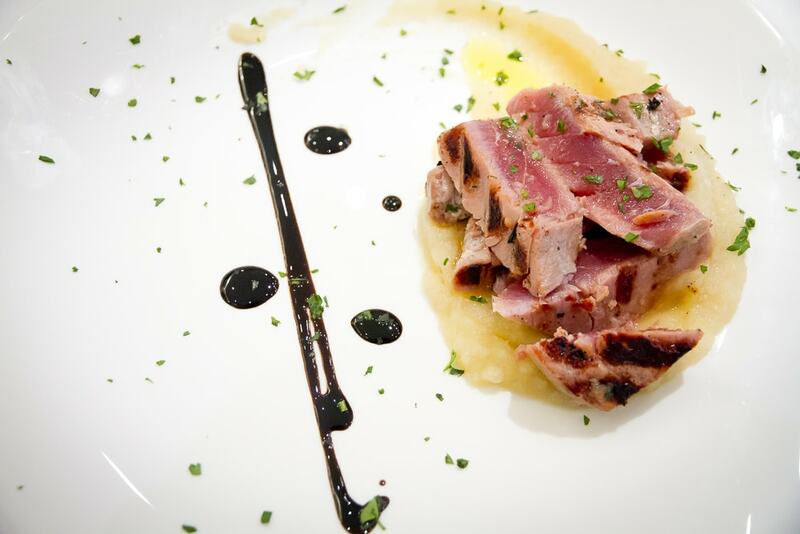 Even though seasoned travelers in Italy might consider the food in this simple trattoria average or underwhelming, for us it was everything we had hoped for in Italy, and SO MUCH better (and cheaper) than anything we’d had in Venice. 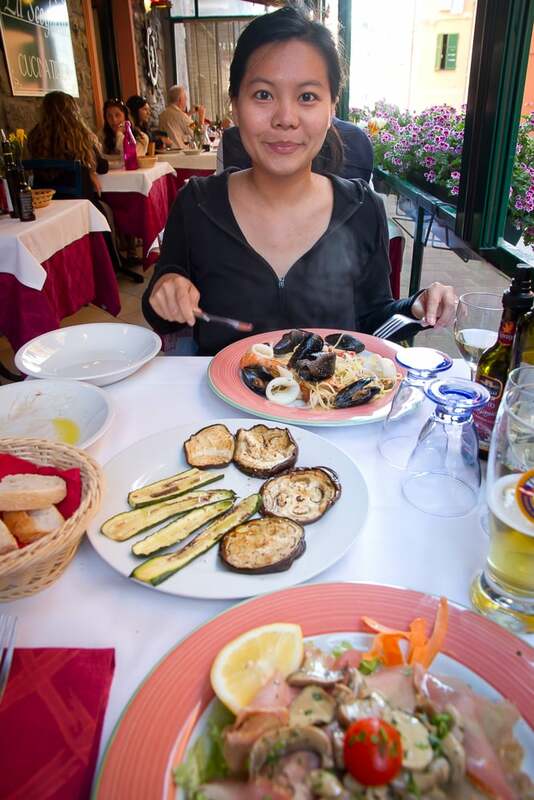 I can honestly say that Emily looked happier with those pasta and grilled seafood meals between us that at any other point during our trip. 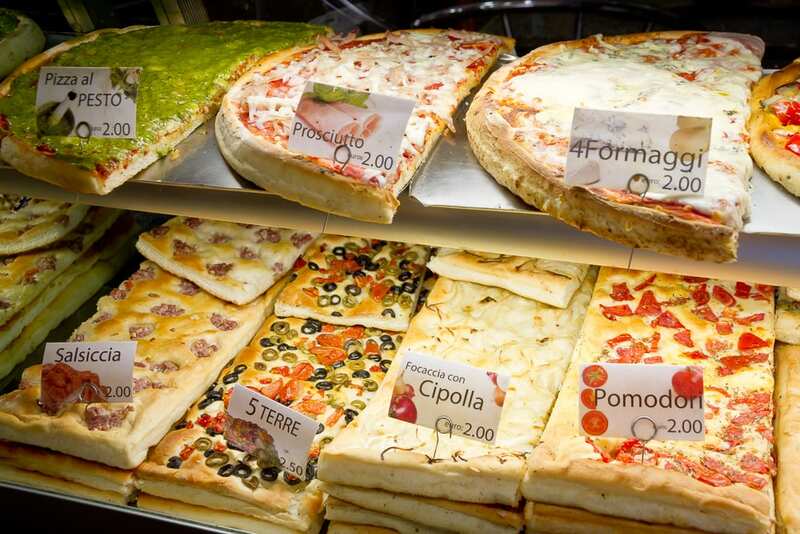 Besides our favorite restaurant, we loved the little focaccia and pizza shops in town, and especially anything with pesto, which actually originates in the Liguria region where Cinque Terre is located. One day, despite being stuffed after a meal, we bought an order of calamari for the walk back to our hotel that was easily the best calamari that I’ve ever had. This calamari was sooooo good! 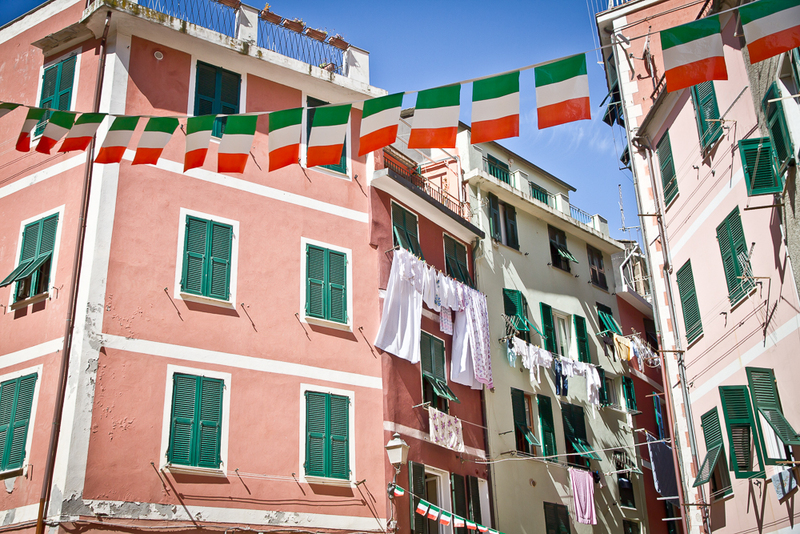 Like Venice, choosing where to stay in Cinque Terre was no easy task. 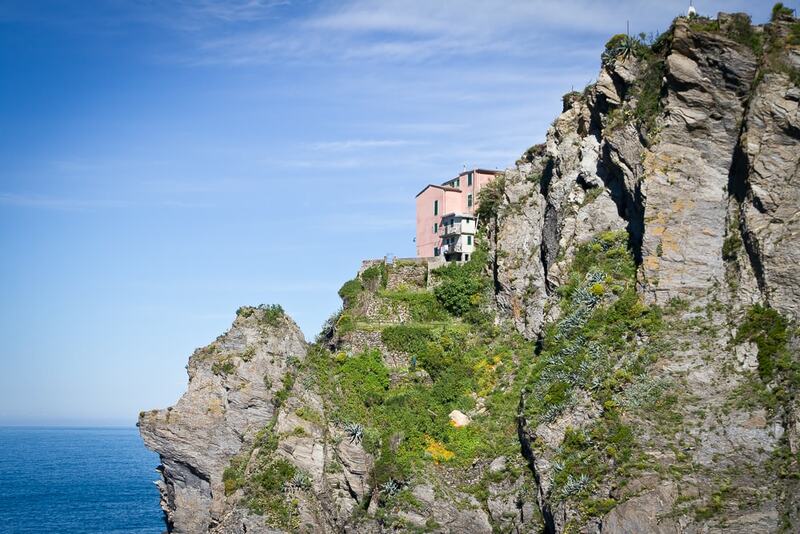 Even after narrowing it down to Manarola, there were many good options. We knew that we wanted a view of the sea and a balcony, so this helped to narrow it down, and we took a gamble on a place that (at the time) had just opened and had no reviews, but seemed to have exactly what we wanted, and for a great price. The hotel was called Vandiris (read reviews / see prices). We wanted a balcony facing the sea, and we got it! Our room was literally the last building on the edge of the cliffs in Manarola. 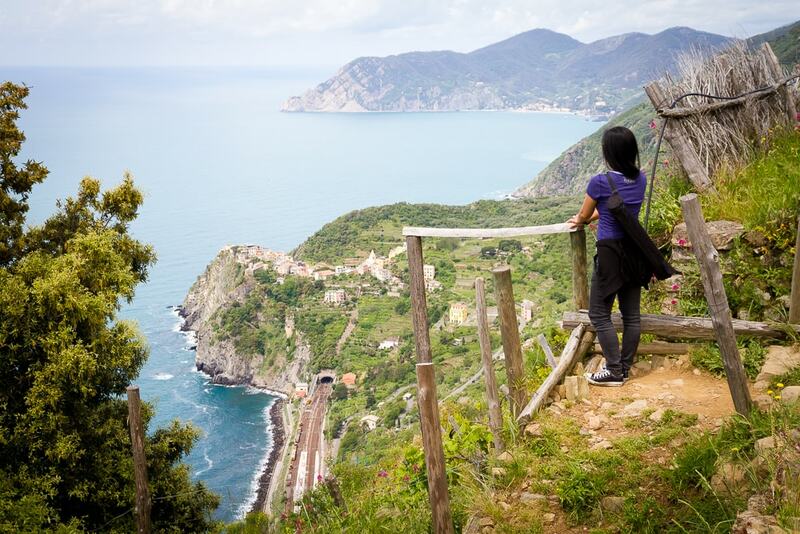 Looking to the side, we could see the Manarola train station far below and an expansive view along the coast. I took dozens of photos of the coast, as the view seemed to change every time the angle of the sun did, but here is one of the most dramatic. Looking up at our hotel from Manarola train station. It was literally the last one in town! It was a bit of a walk to reach our room, but as a result it felt very quiet and secluded, like we had our own little corner of Manarola all to ourselves. Another surprise we had was the view from our hotel room. We’d seen pictures of Manarola and other Cinque Terre villages hundreds of times before, but we’d never seen the view looking out to the sea until we got into our room. 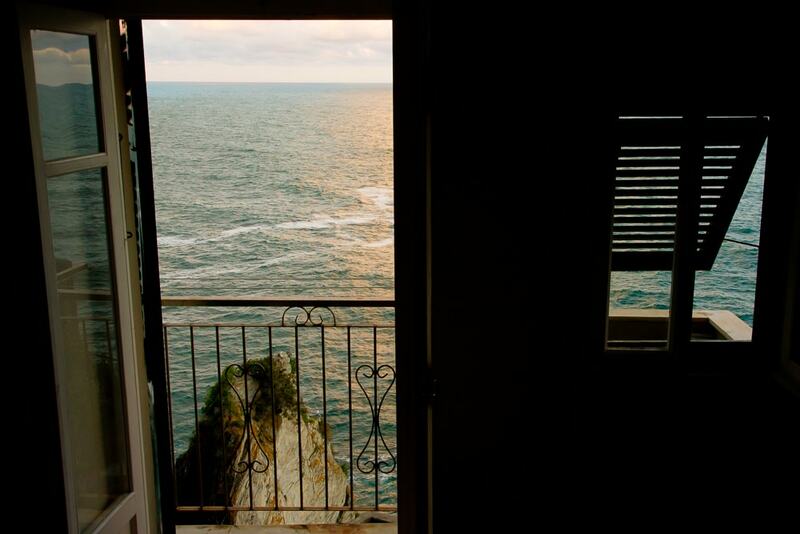 Our tiny balcony was perched hundreds of meters above the sea, looking straight out at the horizon. We spent many hours of our trip just gazing out. 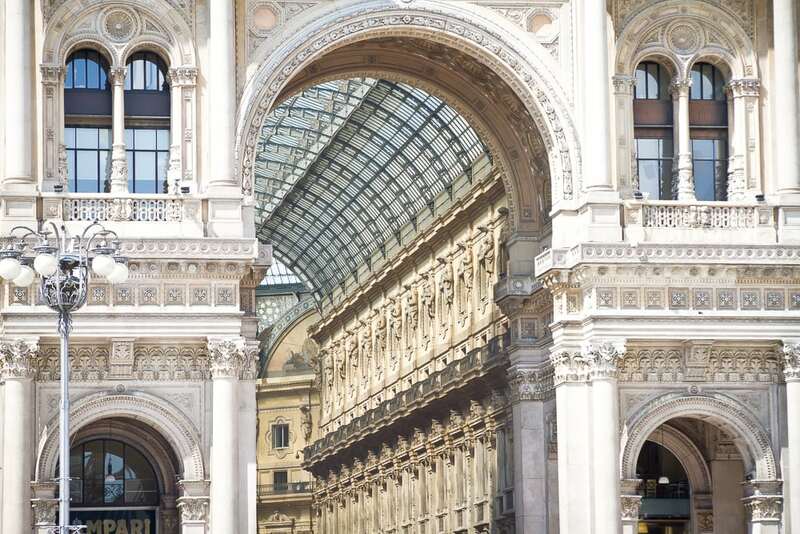 I wouldn’t say that Milan is a must for a honeymoon. 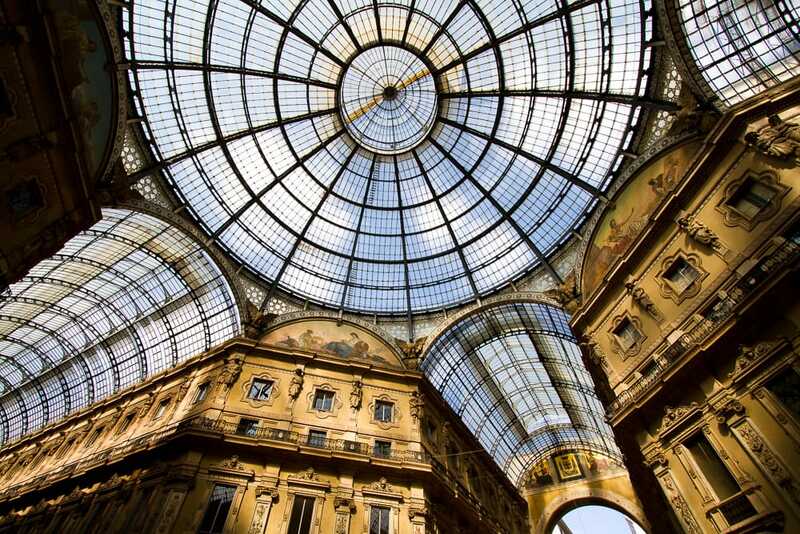 We went to Milan because we flew out from the city, but we chose to spent a night and day there to have a look and because Emily wanted to do a little shopping. Having said that, compared to Venice and Cinque Terre, it was refreshing to stay in what felt like a regular Italian city that is not 100% centered on tourism, and I feel it really rounded out our trip. 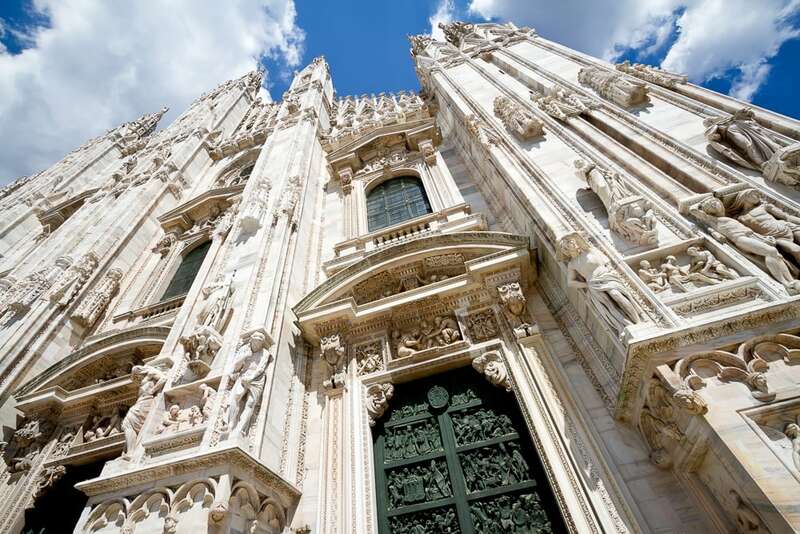 The Duomo di Milano, the city’s most famous church, was truly breathtaking, as was the adjacent Galleria Vittorio Emanuele II, which is considered the world’s oldest shopping mall. 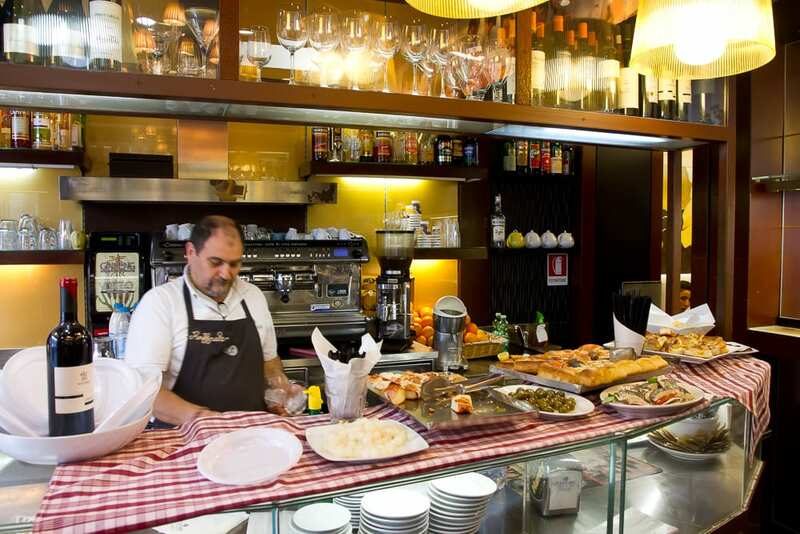 We were also quite excited to try L’aperitivo (aperitif), a Milan specialty. Essentially, around happy hour many bars offer a range of complimentary appetizers laid out on the bar to anyone who buys a drink. You can eat as much as you want, so you can pretty much get a free meal for the price of a drink!